BITS Pilani has come up with an advertisement for Faculty Vacancy for the posts of Professors, Associate Professor in various discipline for it various On Campus at Pilani, Goa, Hyderabad and Dubai and Off Campus study centres at Bengaluru, Chennai, Hyderabad, Pune, Delhi (NCR) and Mumbai. 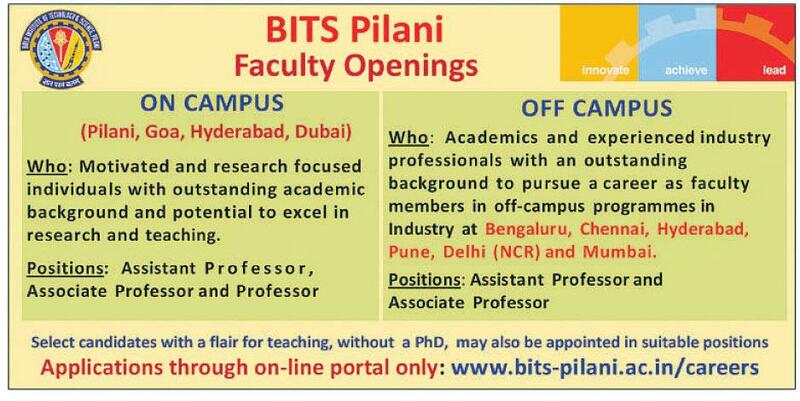 Please visit http://www.bits-pilani.ac.in/careers for all the details and online submission of the application. Applications received up to Feb. 19, 2018, will be considered in the current recruitment cycle. Applications received after Feb. 19, 2018, will be taken up in the next cycle.